EFT - Emotional Freedom Techniques - is a process of tapping or percussing on meridian points in order to improve the flow of energy through the energy body. 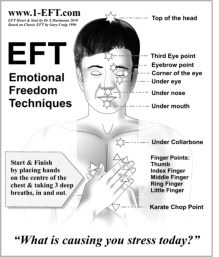 The original EFT protocol, also called The Classic Protocol, used a collection of approaches from different fields of research to bring about a change in the client's presenting problems. After 15 years of practical experience with the Classic Protocol in the field, and a much greater understanding of how to work with energy successfully, the GoE Trainers settled on the new Heart & Soul Protocol as a basic EFT protocol for all comers and all situations. The Heart & Soul Protocol is a simplification and streamlining of the original Classic Protocol which is particularly designed to be easy to teach, easy to remember, user friendly and applicable to the widest possible range of clients whilst at the same time maximising energy effectiveness across the board. This new protocol, in conjunction with other significant developments in approaches to client care, essential theory of energy work, instruments used as well as in patterns and techniques, forms the basis of the new GoE EFT Master Practitioner Training. 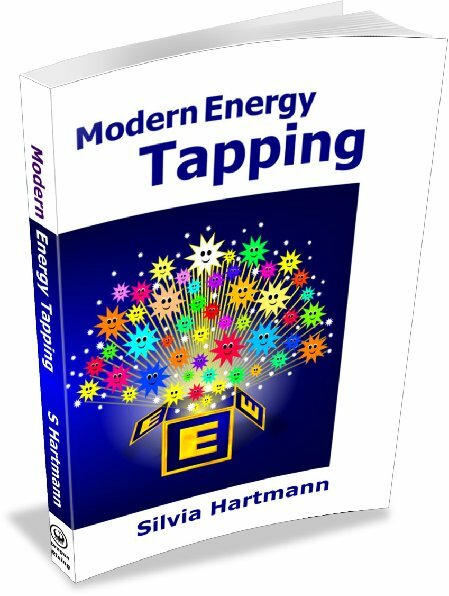 Bringing theory and practice of EFT Emotional Freedom Techniques together to form a cohesive and logical approach to modern energy work is the next step in the evolution. The Energy EFT Heart & Soul Protocol is offered as a basic start EFT protocol to new practitioners and those learning EFT for the first time; as the practitioner grows in experience, in confidence and studies and researches other EFT protocols, he or she will eventually develop their own unique approaches to energy work with their own clients, suited to the circumstances under which they conduct their professional EFT practice. Assume Heart Healing Posture and take three deep breaths, in and out. Say the set up statement and start tapping/touching/massaging the top of the head. Take a deep breath in and out before moving on to the next treatment point. Continue in the same way to the Third Eye point and all following points. 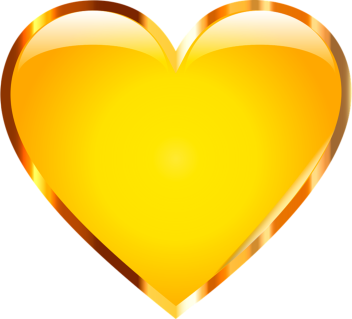 Return to the Heart Healing Posture for a moment of silent reflection. Take three deep breaths, in and out. This completes the EFT Heart & Soul Protocol. * The EFT Heart & Soul Protocol is used in Energy EFT Foundation Course and the EFT Master Practitioner Training Course certified by TheGoE. 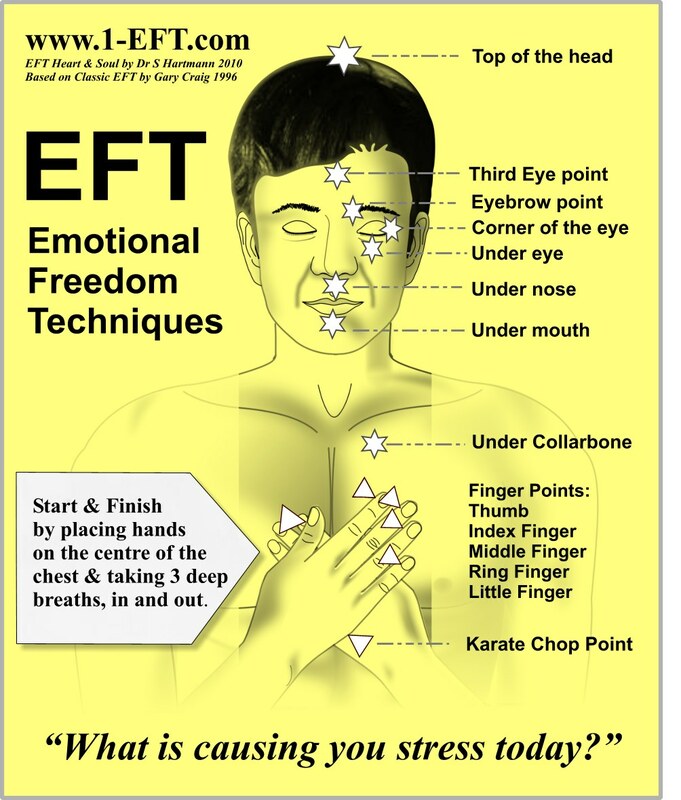 * More information on the changes from the Classic EFT Protocol to the Energy EFT Heart & Soul Protocol.